Paddington Bear Activity Toy Discounts Apply ! The Paddington for baby activity toy stimulates baby's senses and engages their imagination with a host of fun activities to explore in just one toy. 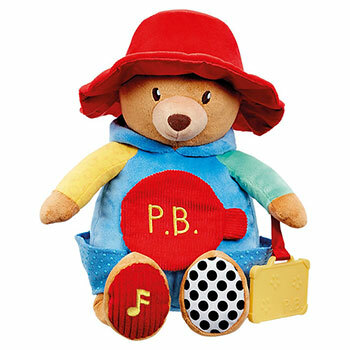 Perfect for little Paddington fans, the super soft activity toy, embroidered in beautiful detail, plays a tune and features a baby-safe peek-a-boo mirror and suitcase-shaped yellow teether.. It has been designed specifically to encourage baby's early developmental skills and includes multiple textures and sounds. The activity toy comes in a platform box and is suitable from birth. .